Home > Heart Conditions > What is Ventricular Fibrillation? Atrial fibrillation, is a serious but treatable condition that does not normally endanger life. Ventricular fibrillation is more serious. It is a major reason why people collapse and die without warning. Treatment is necessary within 5 minutes; after that survival rates are very low and, if someone is then resuscitated, they may have already suffered serious brain damage due to lack of oxygen. During a heart attack, a blockage in one or more of the coronary arteries causes the blood supply to a region of heart muscle to be cut off. This means that the oxygen supply to that portion of the heart is interrupted, and the heart muscle cells start to die. This is known medically as an infarct – which is why a heart attack can also be described as a myocardial infarction. 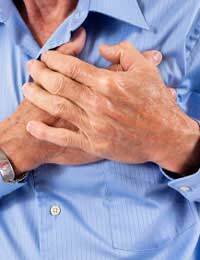 The more serious the blockage in the coronary artery and the larger the region of heart muscle affected, the more serious is the heart attack. Often the electrical conductance system of the heart that controls the normal heart beat is also damaged, leading to a very irregular heartbeat and abnormal heart rhythms. In some people, the heart stops; ventricular fibrillation is a common cause of cardiac arrest. What Happens in Ventricular Fibrillation? The ventricles are the main pumping chambers of the heart. The left ventricle squeezes very strongly and sends blood all the way around the body. The right ventricle sends blood to the lungs to get oxygen; this is then returned to the heart to the left ventricle to go round the body again. In ventricular fibrillation, instead of the ventricles squeezing in a regular pattern, they beat three or four times faster. This means that the ventricles don’t fill with blood and the amount of blood pumped out decreases rapidly. When no blood is coming out of the heart, the body’s systems are all in danger from the lack of oxygenated blood. When Does Ventricular Fibrillation Happen? Ventricular fibrillation is common after a very serious heart attack and is the most common reason for a cardiac arrest. It occurs most often in people between 45 and 75 – the age group that has the highest incidence of heart disease generally. Sudden death due to ventricular fibrillation can also occur in people younger than 40 – this normally happens because of an undetected problem with the structure of the heart. It can also happen in even younger people who have serious congenital heart disease. Ventricular fibrillation can also happen as a result of an electric shock. This can be an accidental one, from a faulty household appliance, or from an electric shock applied in hospital to treat someone who has had a massive heart attack. The timing of the shock in relation to the heart beat seems to be a crucial factor. The heart can also fibrillate if someone becomes very short of oxygen – during strangulation or drowning, for example. Some drugs also have toxic side effects that can lead to ventricular fibrillation. This condition is always a medical emergency. Survival rates during recent years have increased because of first aid training and resuscitations have become more possible because of better access to defibrillators in public places. If the heart stops because of ventricular fibrillation and is not restarted within minutes, death can occur before paramedics can get to the scene. If someone does survive, they will need intensive care in hospital and will need to have many different investigations to find out the nature of the problem and the state of the heart and coronary arteries. People who have suffered ventricular fibrillation are at high risk of it happening again and need very prompt medical attention. After a full assessment, treatment may involve a coronary artery bypass, insertion of a cardiac pacemaker and repair to one or more of the heart valves. With prompt action and good follow up medical treatment, some people do go on to recover after ventricular fibrillation; rehabilitation takes several months but with good aftercare it is possible to then go on to enjoy a reasonable quality of life.